I am super proud to be part of a Leader in Me School! It is an excellent program, one that I believe will help establish a solid foundation for students' entire lives. The Leader in Me is built on the principles of the 7 Habits of Highly Effective People by Franklin Covey. One of the cool things is that, as the program grows in our school, the upper grades get to build on foundations laid by teachers the years before, and expand more on them. However, in Pre-K, I am a child's first teacher. I am the one laying the foundation for the very first time. Every year I start fresh, and I can't build on the work done by another teacher. This has been a unique challenge to me as I seek to embed these skills in the lives of my students in a deep and meaningful way. Here are some tricks I've learned over the last several years of teaching the Leader in Me to Pre-K students. Many of these ideas would be just as applicable to kindergarten or first grade students, too. Note: Due to copyright restrictions, I do not offer any 7 Habits or Leader in Me materials in my Teachers Pay Teachers store. The things pictured here are things I created solely for my own classroom use. If you like something you see, I encourage you to try making a version for your own classroom! 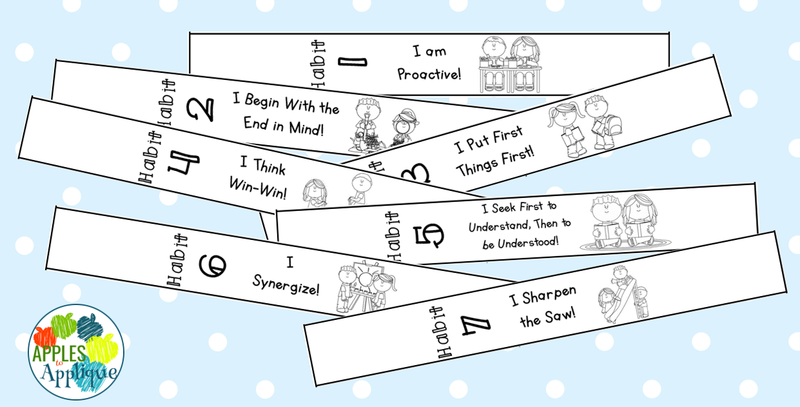 Help students recognize the habits in action by having a 7 Habits clip chart. 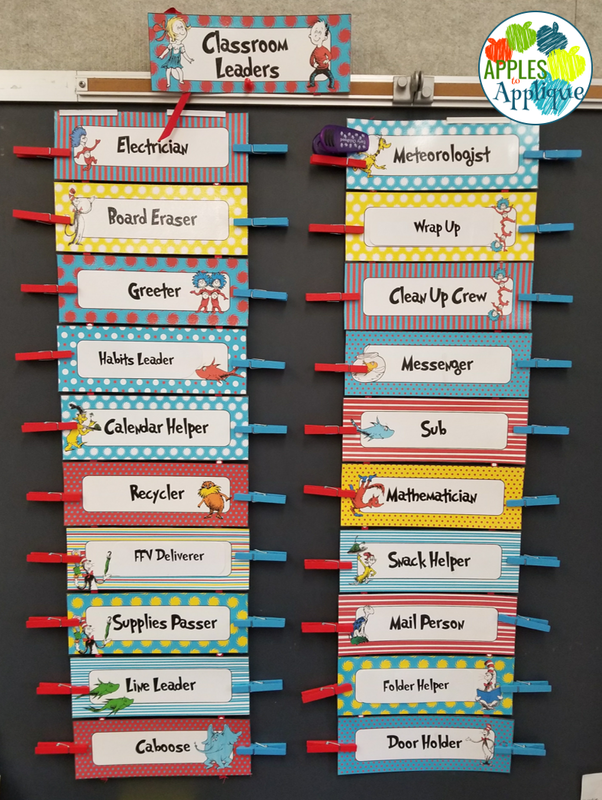 I ditched my old behavior clip chart and use this one purely to recognize good behavior. When I see kids working together, for example, I say, "Wow, I see these two friends using great synergy! I'm moving their clip to 'Habit 6: Synergize' on the chart!" Their clips get to stay on the chart for the rest of the week. I also give them a wristband to wear so they have a visual to take home and tell their parents about. Ideally, I want the students to begin pointing out the habits they see exemplified by their friends, and ask to move their friends' clips. This is such a powerful way to connect the habits to their everyday lives. 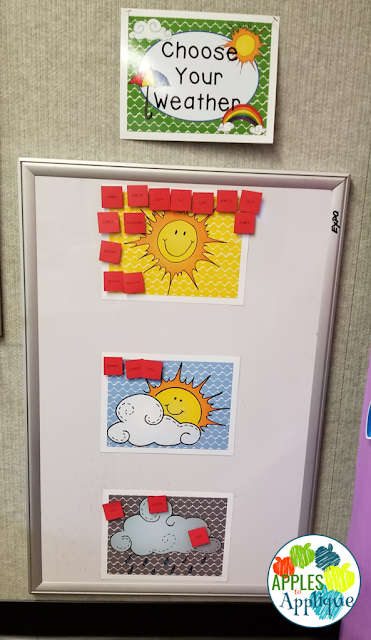 We use a "Choose Your Weather" check-in in my classroom, as well. (Sorry for the weird photo angle). Every day, students come put their name on whatever kind of day they are having. This brings up some great conversations about being proactive and choosing to have a good attitude, as well as how to begin with the end in mind, and what choices we can make if we want to have a "sunny" day. Of course, because I am also a huge proponent of helping children feel and understand their emotions, I also tell them that sometimes we all have "stormy" days, and that's okay. Something I say to my kids often is "It's okay to feel angry, but you still have to make good choices." Then we talk about appropriate versus inappropriate ways to handle our anger. Another vital thing is to give every child a chance to be a leader. We have our class leadership roles, which rotate weekly. Every student, no matter their age or ability level, gets a turn in every role. I have been shocked at how my little ones, even my 3-year-olds, rise to the occasion and show that even the tiniest kids can be leaders. I have non-verbal students who lead our daily recitation of the 7 Habits by leading the class in the accompanying actions; I have kids who I didn't think could handle a certain leadership task just blow me away by how seriously they take their responsibility. I have learned that every child is capable of so much more than I think, and that when I give them the chance to step up and shine, they do. While I don't offer this exact leadership chart due to copyright reasons, you can find many similar ones here in my Teachers Pay Teachers store! One of my favorite things has been watching my students find opportunities to lead that I didn't think of. I have the 20 assigned leadership roles, but my students find so many other ways in which to lead! When they come up with those new ideas, I let them keep that role permanently. For example, I had an ESOL student who was very hesitant to talk in class. However, she noticed everything, and started taking it upon herself to get the doorstop and put it under the door for me whenever we needed to leave the classroom. It was a perfect opportunity for her to take ownership of something in a way that made her feel comfortable; she didn't have to speak to see a need and take care of it. That became her daily responsibility for the rest of the school year. I didn't want to take her feeling of leadership and empowerment away from her by rotating that role with other students. I had another student who took it upon himself to help all of the other students with the soap dispenser when it was time to wash their hands for snack. Typically I took care of this task, and had never even thought of delegating it to a student. This child started doing it one day, and then kept on every day after that. This was a student who had some behavior challenges, so having his very own responsibility really gave him a feeling of importance and control. 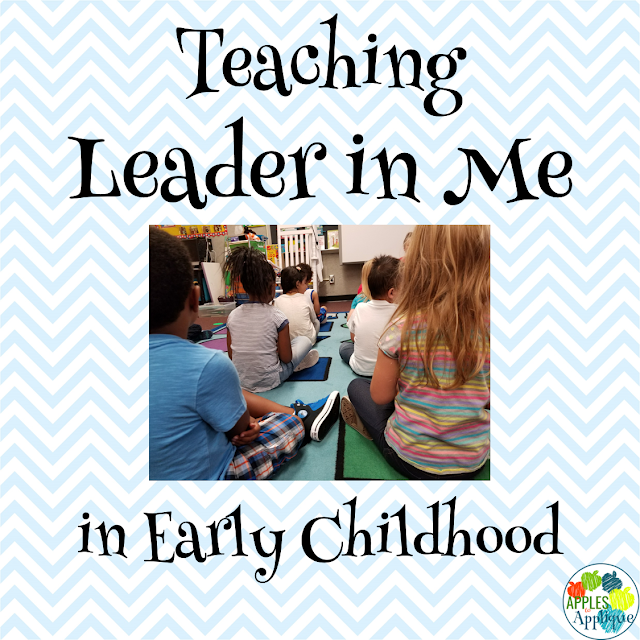 I could go on about how much I support the Leader in Me program, and how I believe it is effective, even for the youngest students. I hope these ideas help you as you implement the Leader in Me in your own early childhood classroom. I would love to hear other ideas from you as well, so leave me a comment!